Work out a plan. Just like the writer of the book made a detailed plan before writing, you need to create a detailed plan before summarising. You need to decide how long the summary is going to be (how many words), as well as the type of summary you’re going to write up no matter whether you are writing a book or a video summary – organize it before you even start. Creating an outline plan before writing will help you to condense information a lot better. Read the book through. Read the book through from beginning to end. Make notes as you go along if you wish, but don’t write anything just yet. The purpose right now is to grow a better understanding of the book’s message. Draw up a list of topics. What topics and themes stood out as you read the book through? Write them down in a list and group together relevant topics. Read chapter by chapter. Now read the book chapter by chapter, making notes as you go along. If the book is yours, you could underline key sections to refer back to. 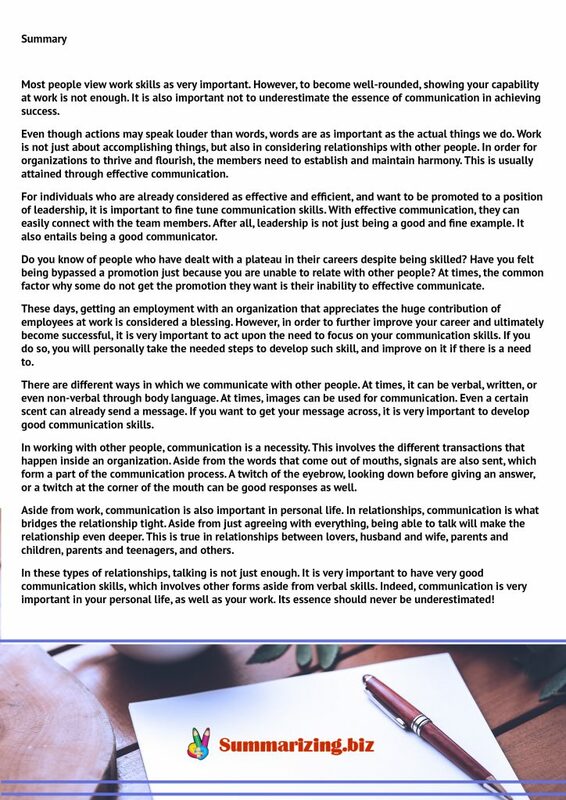 The main purpose of writing notes is to get a better understanding of the chapters and the books’ core themes. Then, put the back away and using only your notes, summarise each chapter before moving onto the next one. Use quotes. Although you don’t want to stuff your summary with them, it’s a good idea to use a few quotes in order to back up your text. Without direct quotes, a reader might be unsure as to whether the ideas in your summary are actually taken from the book – or whether they’re yours. 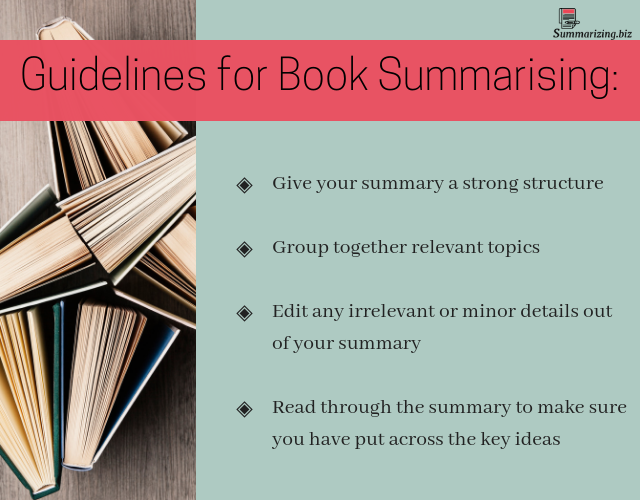 Read through the summary to make sure you have put across the key ideas and edit any irrelevant or minor details out of your summary. 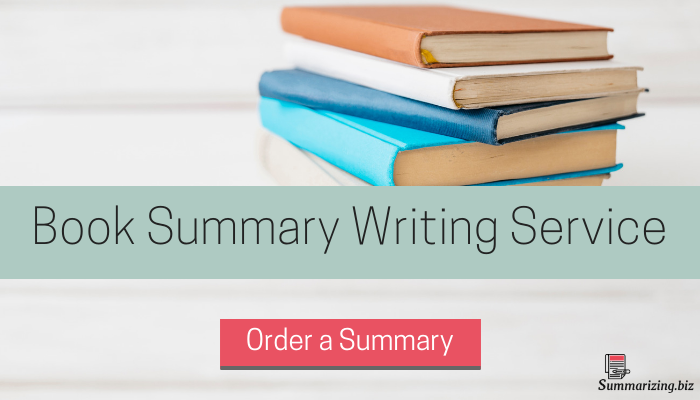 A summary is essentially a condensed version of a book that contains all of its key points. It should be a lot shorter than the original book, and it should comprise all the major arguments while broadcasting the core messages and ideas. Books are often lengthy and convoluted, a book summarizing can take up a lot of time. If you need to summarise a book, let’s take a closer look at how to do this. The purpose of summarizing a book is to make life easier and more convenient for people who don’t have a lot of time on their hands, and as such cannot read the whole book in its entirety. For this reason, it’s your job to simplify the language so that the summary is readable and usable to your audience. The content should be engaging and broken up into small sections and chapters, and it should only include information that is relevant and actionable. A book summary should also be an impartial version of the original. It isn’t your place to add options or bias. Doing so will turn book summarising into book reviewing. Lastly, a book summary should not be stuffed with quotes. Doing so will turn your summary into a collection of extracts. Book summary service is always ready to help you. You can also use our summary maker to create a catchy attention-grabbing abstract for your book. To summarize a book takes a skill and patience that many writers cannot even master. The talent to condense a book and make it just as appealing in an abbreviated form is sometimes left in the hands of writing services house with expert writers. 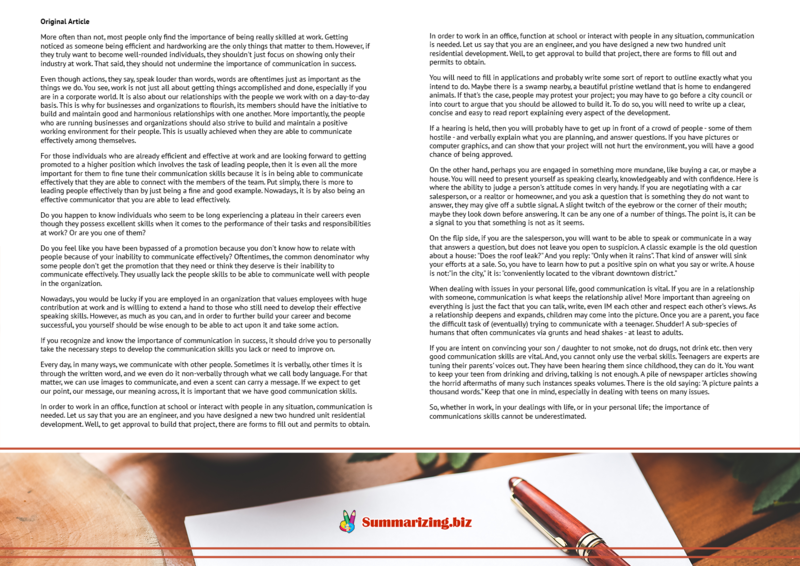 At summarizing.biz, we have just that team to turn your book into a summarized work of art. We make the process of summarizing books as easy for our clients as possible. We take the time to get to the heart of your book and refine a condensed version that appeals to readers. We also take the extra time for revising, editing, and checking for grammatical errors. At summarizing.biz, we understand what an efficient book summarization entails and have a writing group that has the experience in dealing with the process. Several clients have come asking for assistance from our writing staff to produce summary stories with exceptional service. At summarizing.biz, books to summarize are not a problem at all. Whenever we have clients seeking our help, we are able to designate someone from our capable staff to get the summary done – thoroughly and at a price you can afford. For those that have never used us before, we offer a refund should you not be pleased with the work that we create. We are so sure of our writing services that we offer this incentive to our clients. In fact, a majority of our customers return to us for future services. At summarizing.biz, we know the dedication of our staff is exceptional and it is our quality service that has won over clients. Once you decide that you would like us to summarize a book for you, the process is very easy to begin. Just visit our website, sending us all documents along with payment. Once we’ve received payment through our secure site and received a detailed description of what you want from our writing service, a member will be designated to your book and within the scheduled time frame, your book will be returned. If you don’t know how to summarize a book professionally, get good summarized books from our professional service!